When first considering the idea of choosing a realtor to assist in selling or buying a home, the first question that most people often ask is: “Who should we choose as our Realtor?” This is a great question! Finding the right fit when working with a realtor is an important decision and one that can mean the difference of thousands of dollars or finding the perfect home for you! Many of us know someone who is a licensed realtor. Let’s face it….it’s not extremely difficult to become a licensed realtor and most of us know a relative, friend or coworker who works in the business. It is true that acquiring a license to sell real estate is quite different from the rigors of becoming a lawyer, accountant or school teacher and when someone is seeking legal or medical advice they usually seek that of a well trained and experienced professional. Is it any different to think you should trust what is likely the largest investment of your life to anyone less than a professional full time real estate agent? You might be considering choosing a realtor you know because he seems like a nice guy, because you have known him for years or because you would feel bad if you chose to work with a different realtor. The question is however….is that the right reason to choose a realtor when it comes to the investment of a lifetime? The challenges a realtor works through on a day to day basis, along with the experience of time spent on finding and closing deals is what truly sets the full time real estate pro apart from the realtor who works on the side for extra cash, or the waiter who works on the side while trying to break into the business full time. That experience can make all the difference in the world to you as the client! Here is my opinion on the comparison of the part time realtor to the person who makes a living selling real estate, and more than likely is doing what he or she loves to do to earn that living. Knowledge of the Real Estate Market: For a realtor, knowing the market is an important part of being able to give a client the best real estate advice possible. If a realtor spends the majority of his time at a job where he can’t focus on market trends, values, and inventory of current and sold listings, then can he really provide the in depth knowledge that the client seeks and needs? Of course it is possible, but it is more than likely that you will learn the part time realtor does not have the in depth knowledge of a real estate market that you demand as the client. Delays in Communication, Accessibility and Availability of Schedule: When the market is hot and properties are selling like its Wall Street, time is definitely of the essence. 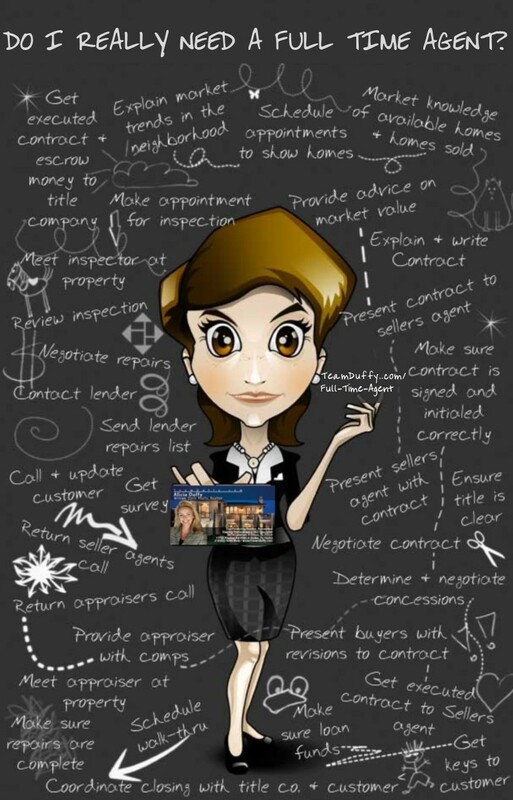 You should be on point and so should your realtor! Someone who is working a different job or busy shuffling the kids to school or soccer practice is almost certainly not going to be available to talk to you when you are having doubts or to show you a property when you really need it. Of course, you will probably get a call back eventually or end up setting up a time to see the homes you wish to visit….but by that time will it be too late? Sometimes hours, even minutes, not days are the difference of getting an offer accepted or seeing that home you thought was perfect with a “Sold” sign in the front yard! As a seller, do you want your realtor to have the time to follow up on showings for important feedback, have the time that is necessary to negotiate an important offer or to have the time for a simple phone call with an update on your listing? Of course you do! This may not always be the case if your listing is in the hands of someone who is counting the current inventory at an hourly mall job! Lack of Experience can be Frustrating: A realtor who sells 3-4 homes a year is sure to lack the experience that can be necessary when it comes to the working your way through a deal! Every deal is different, and lack of experience can be the difference between selling your home to that first buyer who wrote an offer on your home and waiting another 3 months to receive a low-ball offer from a buyer who knows you are getting antsy after seeing your home for sale for longer than it should have been!As a buyer, the entire process can be grueling. From starting to view homes to working your way through mortgage underwriting, this can be exhausting to you as a buyer! Do you want your all-important purchase to be in the hands of someone who has not sold enough homes regularly to recognize the subtle loopholes that can exist when it looks like a deal is hanging on by a thread, moments away from dying and leaving you with the feeling of what could have been? It is safe to say that you want that value of hard work and experience in your corner when it comes to your next home! Johnny on the Spot: The full time agent usually lives, eats and sleeps real estate. This is a full time job and the full timer is all in and ready to help! Real estate is what he thinks about in the morning and he is in it for the long haul. His children’s college education is riding on him getting up in the morning, dressing like a professional and hitting the marketplace with a full head of steam! When it comes to buying or selling, don’t you want Johnny on the spot on your team? Connections: Part of the full time realtor’s job is to be connected, not just to the pipeline clients, but also to those who can best help out when its crunch time and the game is on the line! A real estate professional has likely built connections to local contractors, lenders, other realtors along with many people in the service industries that are out there working on a daily basis to help people just like you! A quality painter who can give a good price can be the difference between selling thousands of more dollars, or a trustworthy lender that is a perfect fit for someone in your exact situation…..these are the types of connections your full time agent has built in the community and these are the people you want access to when you are making your move! Database of Past, Current and Future Clients: A full time realtor should have a solid database of past, current and future clients. To compliment this pipeline of business, many full time agents are involved with a variety of advertising methods with the goal of building future business and thus their database. This is undoubtedly helpful when it comes to marketing and selling your home, or when the market’s current inventory looks bleak and it appears as though your dream home is just not for sale. When this is the situation, out comes the database, several phone calls and voila……your realtor has come through like the professional that he is! Experience (I can’t stress this enough! ): Again, experience is the name of the game and your full time realtor is calling the shots! Whether it comes to negotiations, working a way through a sticky deal or finding the right home for you……someone who is selling homes on a daily or weekly basis has acquired the experience that will get you to your end goal! Every deal is different, so is every contract negotiation, and whatever the situation….chances are that Johnny on the Spot has been there done that and knows just what to do when all the chips are on the table! Experience is on your full time realtor’s side and he wears experience like a badge of honor! Don’t you want him on your side too?